Get ready to laugh, make a mess in your kitchen and chow down on some seriously good food. Vegan cuisine is on the move. And our three chefs serve up a scrumptious variety of vegan dishes with an easy, can-do style. And for the icing on the cake, we throw in plenty of guest chefs. Perfect for both amateur and seasoned home cooks. Get the Vegan Mashup recipes here. Meet the Vegan Mashup hosts! Toni Fiore, host and co-creator of our original series Delicious TV’s Totally Vegetarian, as well as the author of Totally Vegetarian: Easy, Fast, Comforting Cooking for Every Kind of Vegetarian. Toni has a knack for creating easy, delicious adaptations of culinary classics. Her relaxed and accessible presentation is especially popular with public television viewers. Catch more of her and her recipes on Veg-EZ an online video cookbook, A great resource to veganize your home cooked favorites. With 75 recipes and videos at your fingertips. Miyoko Schinner has been a vegetarian for over forty years and vegan for over half of that time. She is the author of the The Homemade Vegan Pantry, Artisan Vegan Cheese, and many other cook books. Despite the success of her cheese book, people frequently requested that she simply make and sell them. To satisfy this demand, she assembled an amazing team of passionate vegans with expertise in different areas, and Miyoko’s Kitchen was born! Now you can order it online! The world is so lucky to have her. 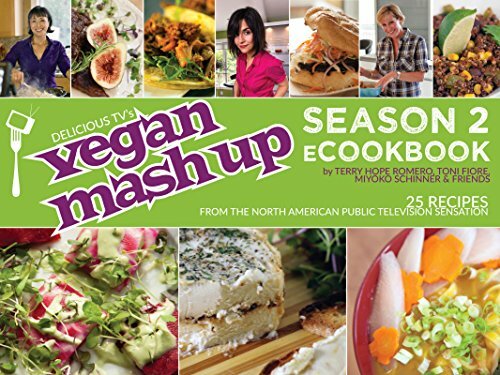 Terry Hope Romero, author and co-author of bestselling vegan cookbooks Vegan Eats World, Veganomicon, Vegan Cupcakes Take Over the World, Viva Vegan and plenty more. Terry has presented cooking demos, talks and cooking classes to hungry crowds at food festivals and conferences the world over. She contributes her Hot Urban Eats column to VegNews Magazine and holds a certificate in Plant Based Nutrition from Cornell University. Check out her website! And, we couldn't have done it without the support of these amazing Kickstarter Contributors.